North Carolina is extremely well known for its large pharmaceutical and medical research facilities within the “Research Triangle” (the area between Raleigh, Durham, and Chapel Hill). The area has developed a support structure to facilitate this local industry, consisting of public infrastructure, specialized businesses, and synergies with the region’s renowned universities. The managers of the Triangle have recently embarked on a plan to make the entire area more energy-efficient. At the same time, South Carolina’s Charleston port has been undergoing a renaissance over the last few years, with a renewed focus on modernizing its manufacturing and distribution pipeline. In order to make the most of their investments, warehouse owners and building managers within the Carolinas should consider utilizing federal EPAct tax incentives available to them for making energy retrofits. Pursuant to Energy Policy Act (EPAct) Section 179D, manufacturers in the Carolinas making qualifying energy-reducing investments in their new or existing locations can obtain immediate tax deductions of up to $1.80 per square foot. There are multiple 30% or 10% tax credits available through the American Recovery and Reinvestment Act to manufacturers in the Carolinas for a variety of alternative energy measures, with varying credit termination dates. For example, the 30% solar tax and fuel tax credits expire January 1st 2017 while the 10% Combined Power tax credit also expires January 1st 2017. The 30% closed loop and open loop biomass credit expires January 1st, 2014. All alternative energy measures that are eligible for the 30% and 10% tax credits are also eligible for equivalent cash grants for the three years staring January 1st 2009 and ending December 31st 2011. Warehouses and distribution centers are ideally suited for solar P.V. installations, given their vast amount of roof square footage. The credits described above are ordinarily eligible for 5 year MACRS depreciation, but warehouse owners who install these renewable energy systems after September 8, 2010 through December 31, 2011 can take 100% depreciation tax bonus immediately. Even if building owners miss this 2011 window, they can enjoy a 50% tax depreciation bonus on alternative energy equipment placed in service from January 1, 2011 through December 31, 2012. Much of North Carolina’s warehouse development in recent years has been centered within the Research Triangle. Many companies across North Carolina have attempted to obtain LEED certification, the marquee standard for sustainable buildings. For instance, during the construction of Quintiles' (a pharmaceutical research company) new 252,000-square foot world headquarters in the Research Triangle Park, the company installed mechanical systems that lowered energy consumption and reduced Quintiles’ carbon footprint. Similarly, the Piedmont Triad Aerotropolis Initiative, an idea the authors have previously discussed in an earlier article , is in the process of building a 930,100 square foot facility in the heart of the Triangle to house a multifaceted distribution center with a focus on energy efficiency. However, not all of North Carolina’s warehouse development has been clustered into the Research Triangle area alone. For that matter, many other large commercial properties in the state have undertaken plans to become more energy efficient, especially data and logistics centers. Figure 1 illustrates the square footage of many existing warehouses across the state along with their EPAct tax saving potential. In the first week of June, 2011, South Carolina legislators granted Amazon preferable tax treatment in response to Amazon’s promise to build new distribution facilities in the state. Yet the Amazon deal is merely one part of a broad, overarching plan to support growth in the Charleston port area, which is the source of around 10% of the state’s jobs, by connecting the port to major, modern, energy-efficient distribution facilities. The Charleston port area has both direct economic and indirect consequences for commercial properties, particularly warehouses, distribution centers, and manufacturing facilities. On the one hand, the port has a $45 billion fiscal impact on the state, and in order to support the importing, exporting and transportation of goods, many manufacturers are strategically located close to the port. By the same token, the health of the port system is critical to the entire commercial real estate industry in the state. 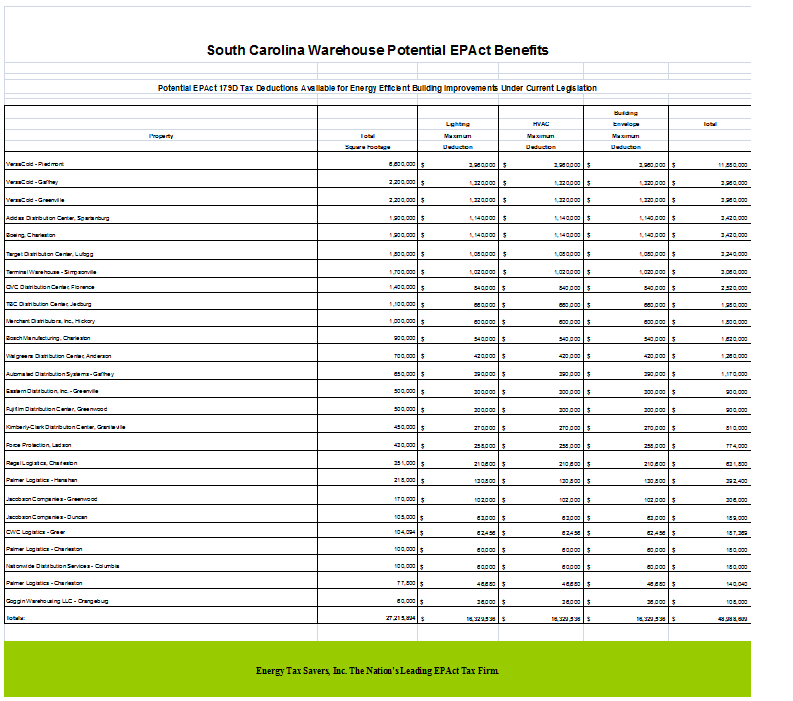 Figure 2 presents the EPAct tax savings potential available to many existing warehouse owners, distribution centers, manufacturers, and logistics companies in South Carolina. Included in Figure 2 is Boeing’s new assembly plant in Charleston. Boeing’s 1.9 million square foot facility, built in the heart of the port area, is a perfect illustration of the importance of manufacturing and distribution to South Carolina. The state offered substantial funding to the project because it is estimated to create nearly 4,000 jobs and attract new business to the area. 1.Assemble team including experts for EPAct tax incentives, utility rebates, lighting, heater, envelope and solar. 2.See if roof is compatible for solar and heater. Obtain solar and any needed roof/insulation proposals. Make sure existing roof warranties are compatible with solar P.V. installation. 3.Obtain lighting design that replaces all inefficient lighting. Compare and contrast fluorescent, induction and LED lighting alternatives. 4.Obtain Cambridge heater or equivalent design proposal based on proposed roof design. 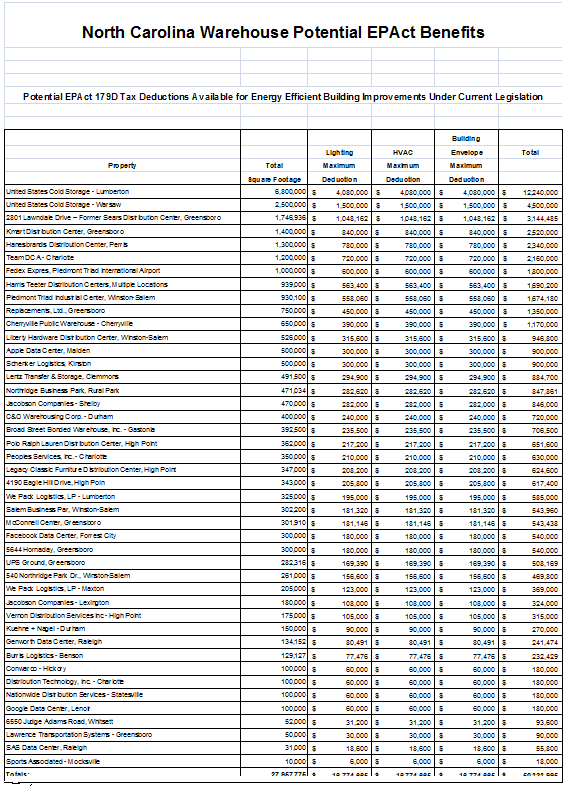 5.Determine utility rebate based on all proposed separate and combined measures. Lighting will reduce electrical use. Roof, insulation and heater will reduce therms. 6.Determine tax incentives including EPAct tax deduction benefit and solar credit tax deductions. EPAct will be based on total project square footage, including mezzanines and pick and pack modules. The 30% solar tax credit will be based on the combined solar material and installation costs. 9.Hire contractors and execute project. 10.Have EPAct modeler and tax expert prepare IRS approved software model and tax documentation. 12.Reduce Federal and State estimated tax payments for large tax deductions and credits. 13.Celebrate tax enhanced energy-efficient building achievement. The Carolina’s have become increasingly important to the nation’s importing and exporting industries, especially along the Eastern seaboard. As a result, they continue to experience robust growth in their manufacturing, warehousing, and distribution sectors. In order to optimize their operational expenses, appeal to energy-conscious customers, and stay at the forefront of a changing economy, owners of these building categories must make energy efficient building investment supported by large tax incentives.